Dr. Sven A. Beiker is the Founder and Managing Director of Silicon Valley Mobility, a consulting and advisory firm serving startups, venture / consulting firms, and corporations to understand trends in mobility. The firm specializes in market sizing and implementation roadmaps for mobility topics. Dr. Beiker brings to bear his well over 20 years of experience gained during his tenure at McKinsey & Company, Stanford University, and the BMW Group. 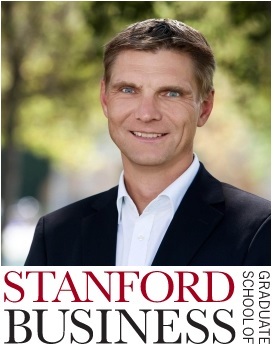 In addition to his consulting business, Dr. Beiker is a Lecturer at the Graduate School of Business at Stanford University where he instructs students on strategies for startups and corporations in the field of automated, connected, electrified, and shared mobility. He also serves as the Automotive / Mobility Advisor for the German American Chamber of Commerce in San Francisco and as a member of the Scientific Advisory Board for the Lecture Notes in Mobility of Springer Science+Business Media. Well, four trends to be exact: autonomous (i.e. vehicles will drive themselves), connected (i.e. the internet of cars), electric (i.e. electric replaces gasoline and diesel), shared (i.e. access becomes more important than owning). Ok, everyone knows that, but the important part is that all those trends happen at the same time, will completely transform the automobile and how we use it over the next 20 years, and therefore need to be looked at in a combined way. That is even more exciting than ABS! We are talking more about mobility as a service (i.e. how do we move people around and turn that into a business) than talking about the vehicle as such (i.e. which used to be largely talk about engine, wheels, styling). There are a lot of opportunities to capture additional revenues and create new businesses. That is also why many non-automotive newcomers (think internet search companies…) are getting into this space. While this can be seen as a threat to the incumbents (think Detroit and friends…), I find it fascinating to see how a new industry structure emerges, which by the way no one has fully figured out, yet. The great shift is to sell miles as opposed to cars – period! But that’s easier said than done as the incumbents have a hard time changing their business models (and by the way car sales are going well at the moment) and the newcomers figure that it is actually not that easy to get into this space (and by the way they still need cars to realize their great new ideas). So, while the idea is to sell miles instead of cars, the vision is that mobility is there when you need it and an absolutely seamless experience. We will see more partnerships forming in the industry. And that is between incumbents and newcomers but also between incumbents themselves. So the term “frenemy” will be very present as the industry as a whole will figure out what infrastructure is needed to make the vision of autonomous-connected-electric-shared happen. This infrastructure includes three things: technology, roads, policy. Because it is key that an infrastructure is broadly available and usable, all need to work together. We are actually seeing the first frenemy coalitions. I got really early interested and actually involved in those coalitions during my tenure as Executive Director of the Center for Automotive Research at Stanford University (CARS). We had 30+ industry affiliates (car companies, suppliers, tech companies, insurance providers etc.) and the goal was to envision the future of mobility together. Easier said than done. But those infrastructure topics worked very well as everyone saw the need and didn’t see much of a downside discussing this together. One spinoff was the “Legal Aspects of Autonomous Driving” program at the Stanford Law School or the “Vehicle Connectivity Affiliates Program” at the School of Engineering. From there I have seen many good examples in business consulting over the last years and now I am making this my mission as I am embarking onto my next journey with my own consulting and advisory firm Silicon Valley Mobility, LLC. I guess that was “choosing sides” between Germany and Silicon Valley. Being a German native and having the perfect pedigree in the automotive industry and at the same time having found a new home and inspiration in Silicon Valley, where would I have my center of gravity? Would I give up my corporate career with one of the top car companies in the world or do I pursue “the next big thing” in Silicon Valley? I went for the latter but never lost connections with the former. My learning was what my mentor at BMW told me when I was weighing those two things: “don’t dream your life, live your dream”. Now looking back, I can tell that it is so much more powerful if one does something from the heart than doing things (only) with the head. My clients benefit from my long and diverse experience in the field, stemming from industry, academia, and consulting. I bring to fruition a unique combination of technology and business understanding, which help me to generate market sizing and product roadmaps for all those new mobility concepts. When engaging me, clients appreciate that we take their initial thinking of how the market might evolve, build out future scenarios together, and then check them for plausibility. In the end, clients develop a much better understanding of what the future will look like in their specific field of business and technology. Well, I typically say “lead by example”. I just find that setting a positive example and making the first step helps others to join for the journey as they see that I am committed. I also find that giving team members as much freedom as possible and support them in their strengths is key. This is based on the assumption that team members generally want to accomplish, have different skills, and intuitively know where to go. So my role really is to orchestrate the whole team and not to tell everyone what to do. This of course requires that team members really want to move things forward and that overall we have the skills we need. Something that I have learnt during my time in industry, which is “not the big will eat the small but the fast will conquer the slow”. There is really a lot to it as size only matters so much, especially as we are seeing great newcomer growth stories in the automotive / mobility field. So this turns into something where those who don’t drive the change (or at least adapt quickly) will be left behind and eventually fail. The challenge of course is to identify what is a long-term trend and what is only a short-term hype. Therefore it is also important to not just think in “black or white” terms but to really understand what lies in between –which is actually where the future is going to be.